It is so easy to find a recipe online these days but there remains a certain joy to paging through a recipe book and there are always a few books I reach for (hand written notes of recipes flying out as I open them) when I am looking for something a bit more old school. And then I find myself changing the recipe completely! I am by no means a master baker and misunderstood science at school too much to even attempt to change a baking recipe but I always tell myself I can make a trifle if it does not work. 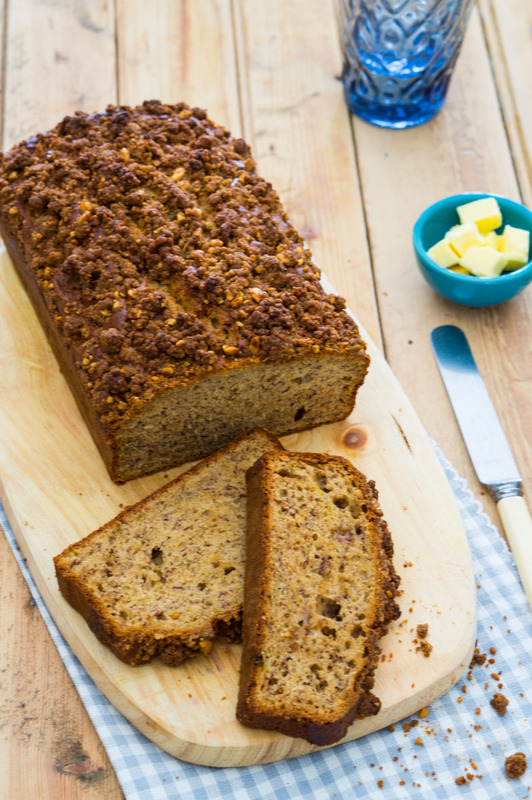 My first instinct is always to cut the sugar – I find too sweet masks other flavours and in this recipe the bananas adds a lot of their own sweetness plus the streusel on top packs a sweet punch. I wanted to cut the butter and thought peanut butter would add a good flavour. The peanut butter does not overwhelm and adds some depth to the banana flavour. I think adding the streusel on top works really well. 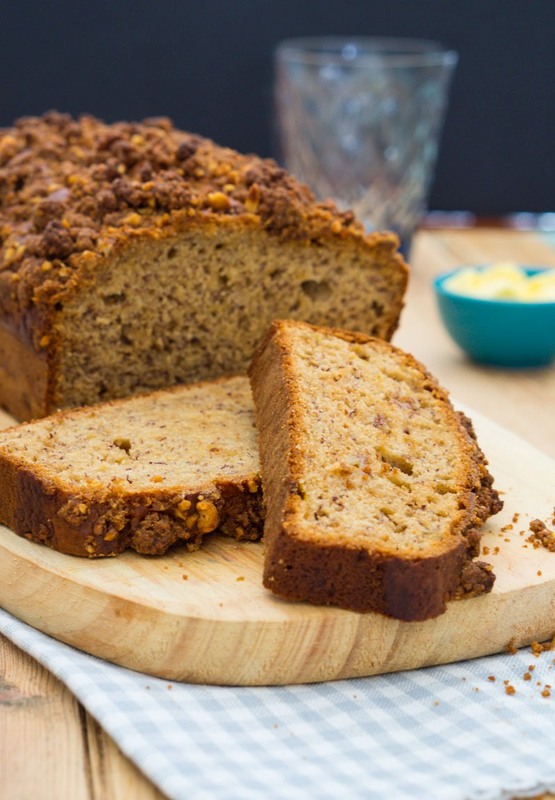 It carries the peanut flavour and adds a wonderful sweet crunchy texture which elevates the humble banana bread. Preheat the oven to 180 degrees C. Grease a 2l loaf pan and line the base with baking paper. Combined all the streusel ingredients and rub between your fingers until it resembles breadcrumbs and set aside. Beat the eggs and sugar until pale and thick. Add the peanut butter and beat until combined. Mix in the bananas, vanilla extract and yoghurt. Sift the flour, baking powder, bicarb and salt. Add the flour mixture to the egg mixture and mix until just combined. Pour the batter into the prepared loaf pan and smooth the top. Sprinkle the streusel on to the batter and press it lightly down. Bake for 50- 60 minutes until a toothpick comes out clean when inserted into the middle. Let it cool a bit and turn out onto a wire rack. Remove the baking paper and let the loaf cool completely. Makes 1 medium loaf. The bread freezes very well. Slice it once cooled down and freeze in small batches. It does not take long to defrost and is still wonderfully moist.